Bishop and his crew continue to excite and enchant us in Book 2: Revenge for LouiseHaving discovered the fate of the world is now resting in their hands – the crew flies to Gibraltar to prepare to launch their operation in the Libyan Desert. While prepping for their mission in a hidden cave deep in the Rock of Gibraltar, Bishop sends the crew and pixies out for a well-deserved night on the town – he was lucky enough to have the foresight to hire out the bar for the evening! On the quieter side - Bishop prepares an incredible day of pampering and luxury for his beloved Louise – followed by a splendid dinner and .. well, sorry – I’m not going to spoil such a well written moment for you! In an evil twist – the electronic noise is what brings the demon to our world! I am still trying to decide what exactly the world would do without internet and chaos that would ensue – luckily our tech-witch did save some things to keep the world from trying to self-destruct! But – Go read a newspaper!!! If you are wondering why I gave this book 4 stars (4.5 is more accurate!) 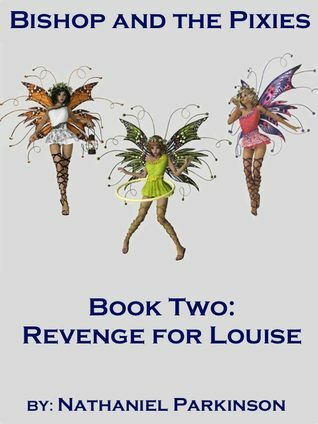 – I love the laugh out loud antics of the Pixies – and wished this book had more of it! What a hoot! For those of us that loved Bishop and the Pixies, the continuation of Bishop and Louise's story (not to mention the antics of Pixies) is a fun romp around the globe as the troops gather to save the world. All the great characters are back (I have a soft spot for Sgt. 's Willoughby and Melanthorpe) and I thoroughly enjoyed the crazy bar antics. For some fun escapism, these two books are a great start. Enjoy! I read the Kindle version and it needed a proof reader. Some passages are garbled and this spoiled the flow. Other than that it is a jolly romp. The pixies are great. Nathaniel Parkinson - Nat lives in Maine with his wife Andi, two of their three daughters and a one eyed cat. All of them serve the true owner of their house, Albert the Shih Tzu.